Hello, posting late today. Today was our daughter's birthday, tomorrow is my husbands. Always falls during Thanksgiving week, so always hectic. 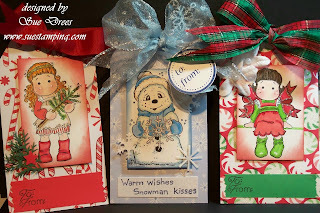 I am posting three Christmas gift tags I made. They are all Magnolias. I'm trying to put together some things for my sister to take to a group Christmas party for door prizes. Awwww, these turned out wonderfully Sue!! There's the wonderful Sue colouring, fun glitter, beautiful bows, fabulous creations, all of them!! All of these November birthdays!! My mom's birthday is on the 20th, as you know my son turned 3 on Monday... We've all got something in common... cold weather entertainment, hahahahahaha!!! Beautiful tags, Sue! Hope your family has great Birthdays and have a Happy Thanksgiving! Your tags are so adorable, I love the colours and the fabulous new Maggies. Thanks for sharing and wishing you & your Family a Happy Thanksgiving. You have taken my breath away with these tags! wow I just think they are so beautiful! 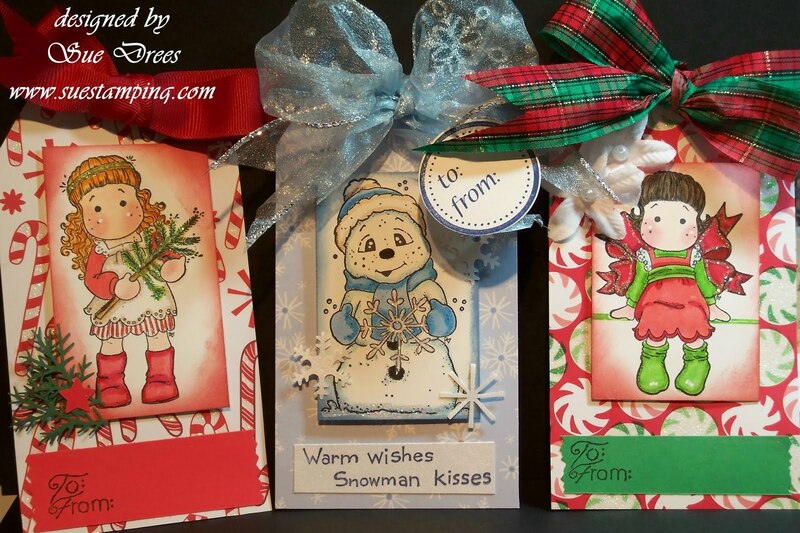 I love your christmas gift tags! congrats to your husband and your daughter Sue! This will be delightful door prizes for some very lucky folks.